Autodemo throws it back to 2003, when we teamed up with the New York Times. Movies.nytimes.com was the first of many major newspaper offerings to capitalize on the growing community of movies news and information search. Visitors were given the chance to search by top links or to break down specific target criteria in a pull down menu. What made this site so special was its access to the deep libraries of New York Times’ reviews and other specialized content. 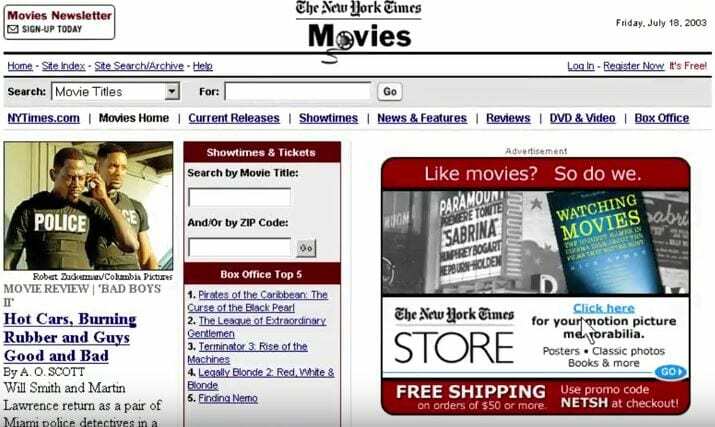 The New York Times made searching movie information much easier in 2003. The New York Times Company brings a certain prestige in the world of print. Given their industry changes, Autodemo jumped at the chance to help demonstrate their evolution to the online world. Many of the features of this nearly 14 year old site might seem commonplace to modern audiences. What set apart this effort in 2003 was its novelty. Since Amazon’s IMDB service was the only site offering similar service, The New York Times and other prestige newspapers decided to capitalize on their news base and deep content reach. 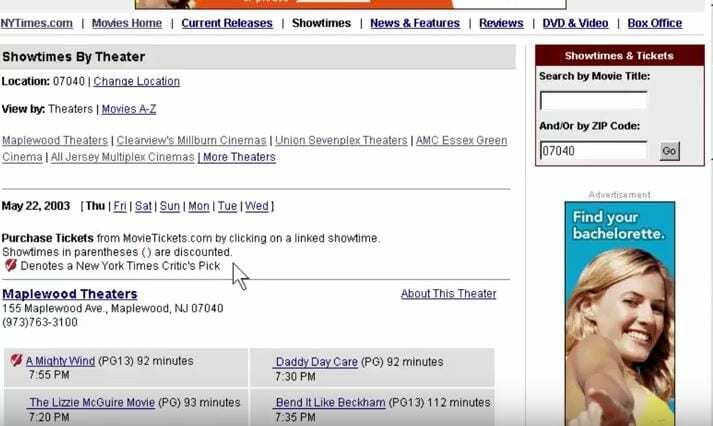 The demo video mentions how its movie ticket buying service was in partnership with MovieTickets.com, however that service offered many options. The video does a great job highlighting the interlinked nature of the website, but in a way that viewers won’t become overloaded with options. In addition, the average consumer visits a major movie news source for a few options. So, the video gives a direct read of basic needs. A consumer might need a simple information request or to find a nearby theater. In addition, the website offers film buffs a focused archive to read the reviews of Elvis Mitchell and other great critics. The New York Times has it all covered with its specialized movie website. Sky marshals first appear on American commercial flights. US Interest Rates at 45 year record low of 1% and core inflation rate of 37 year record low 1.3%. Italian scientists clone a horse named Prometea. Libya agrees to give up Chemical Weapons. JK Rowling’s fifth Harry Potter book “Harry Potter and the Order of the Phoenix” arrives in stores. ABC’s 20/20 airs the controversial Granada Television documentary “Living with Michael Jackson”. Nine-week general strike in Venezuela calling for President Chavez’s resignation ends in defeat. Scientists uncover the fossil of a new species of flying dinosaur in northeastern China thought to have existed 120 million years ago. Scientists publish the first comprehensive analysis of the genetic code of the Y chromosome. Three fossilized skulls found near the Ethiopian village of Herto in 1997 have now been identified as the oldest known remains of modern humans.